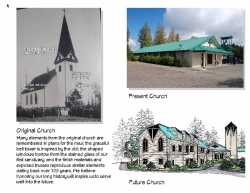 Vinland Lutheran Church was founded by a sturdy group of Norwegians in 1904. Built on land donated, cleared and cherished by neighboring Norwegian farmers, the church stands as a testament to their legacy. Destroyed by fire in 1960, a new building was immediately constructed. In 2010 we began a capital campaign geared to raising funds to build a new two-story structure housing offices, classrooms and a large social hall and kitchen. The top floor is now complete and we are excited to share this space! Eventually, the current building will undergo a renovation. We are determined to make more space for God's grace to welcome the people of our growing community.